Stored indoors 2008 – 2017. Fully loaded with all the bells and whistles . 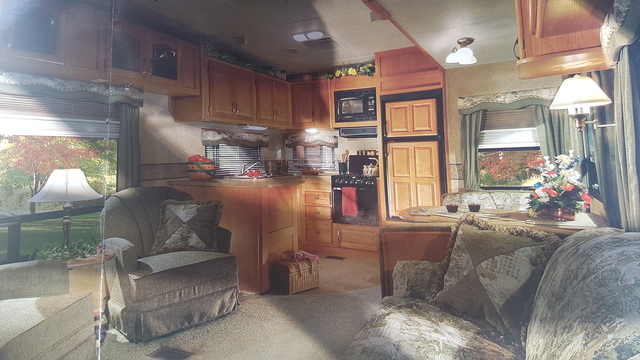 Interior in excellent shape and extremely well kept – custom built by 2 retirees for that majority of its life 2008 – 2017 – still smells like new trailer . Trailer is currently winterized and water / plumbing system never used by second owner . Stored indoors most of its life. Purchased for $27,000 in 2017 - have to let it go as of a recent move to the city . Come take a look ! Located in Revelstoke, BC. Contact me for any questions or to see video footage ! Enjoy the beautiful spacious oak front drawers. All wood drawers glide open easily on metal tracks . Convenient laundry chute to the lower level you can get all your laundry out of sight and ready machine. Its easy to see that Sandpiper has one of the most beautiful interiors on the market today. Designer draperies accent the rich sofa fabrics to complete the upscale look and feel of elegance. Theres no questions as to why Sandpipers interiors are being compared with some of the most expensive products in the industry. Sandpipers open concept master bedroom features plenty of room to relax and enjoy life on the road. The large adjoining bathroom features a neo-angle shower, oak cabinetry and a mirrored vanity. Theres nothing like a pleasant breeze to keep the air moving throughout your Sandpiper, the ceiling fan will provide you with plenty of quiet comfort. Scammers dont waste your time – you will be reported immediately !